Hasselblad enjoys the reputation of being the "Rolls" of the medium format. The design, the universality of the system, the overall quality of the crafting, the pictures of astronauts walking in space built this image, the fashion magazines propagates it on glazed paper. This should not make forget that in 6x6 the best current technical offer is undoubtedly Rollei. See on this subject the Rollei 6008 camera by Philip Greenspun, including a Rollei/Hasselblad side by side comparison. Avoiding to beat dead horses about the quarrel of formats, the logic however directs towards the 6x7, closer to the publication shape. In this format, the attention must be held by the Pentax 6x7 for its robustness, its optical range and its quality/price ratio and by the telemetric Mamiya 7 for its handholdability . Already excellent, the Pentax 6x4,5 had been improved with the autofocus. The new Contax 6x4,5 has joined it like a logical choice for a single equipment (with the Zeiss advantage). A new Mamiya 6x4,5 has been introduced in May 99'. Here is the problem: the 6x4,5 is justified as a single equipment, but not in addition to an yet owned 35 mm system. To really benefit from the medium format, it is better to choose 6x7 than 6x4,5, a little skimped on the size of film. After having celebrated many other brands, why did I choose Hasselblad ? For its design and its reputation. And I don't regret it, optics deserving their reputation, with (rare) weak points and true jewels. The CF lenses were introduced in 1983 to replace the C lenses. Two important features were new : the mechanical devices and the leaf shutters. But the optical parts were the same. New lenses were introduced later :the 40 CF and the 50 FLE (both with floating elements), the 500 apo and the 180 CF. Some comments: The 120 mm Makro disappointed me, no matter what say some with greedy expressions. I expected a top lens and it is only a good lens. It is sharp but the image is dull. Look to my test of the 120 CF and 110 F (in French). I do not believe that it is about bad luck, some experts checked this point of view. See also Philip Greenspun and Olle Bjernulf . Thanks to Michael Heal who corrected a previous error on 120 Makro CT*, which is f 5,6. They are optically similar but not identical, therefore may not be twinned concerning results. The 50 mm FLE has very for him but in staging I prefer the bunch 40/60/100/180 instead of 50/100/180. It's not doubtful that for one having a 80 mm, the group 50/80/150 is perfect. The CB haven't F capability (the position to keep the leaf shutter fully open, allowing the use of the lens on the cameras of the 2000 and 200 series). They aren't compatible with the 202 FA. The optical formula of the 60 and the 80 CB would be the same as those of the 60 and 80 CF; the formula of the 160 CB is different of that of the 150 CF. But the quality would be as good. I think that a purchaser of a CB lens will never regret it, if he doesn't expect to use the 2000/200 cameras..
the CFE are on the same optical basis as the CFi, but implemented with the E electronic contacts to allow automatic control with the 202FA, 203FE and 205TCC cameras. However the 350 CFE super achromat is a new optic of absolutely top class grade. The users were in praise of such a lens in the middle-long range : imagin a 35 mm brand which couldn't offer a 180 or 200 mm lens with ED glasses ! 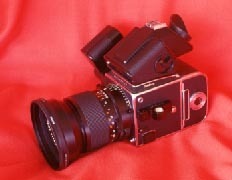 The F line was developped for the 2000 cameras with focal shutters. Some comments: all the F lenses are of high level. The 110 mm is exceptional. It's image is even more brilliant than that of the 100 mm CF, the definition in the center is excellent, even with full opening. The weakness in the corners with f 2 is real but not objectionable in most works, because it concerns only the last 10 mm from corners and disappears while closing the diaphragm. Look at my test of the 120 CF et 110 F (in French). The 350 mm is good but a pain in the neck to use : a critical DOF at f4, and a bulky outfit prone to vibrations. I improved the results and reached what I hopped in applying a classical suggestion: putting a heavy but soft load on the lens in its middle, right upon the axis of the ballhead. I will show this combo. Olle Bjernulf lists the global results of MTF tets of optics published in the Swedish magazine Aktuell Fotografi. These measurements are all the more interesting since the tests of medium format lenses are rare (one might read in French Les Moyens Formats by Paul Salvaire, by far the best book I know on that topic - and yes, I own the Bob Shell and Enst Wildi's books). The values published for Hasselblad optics accord exactly with my qualitative opinion, in particular the weakness of the Makro 120 mm. Nota :I would be glad to access to tests published in German Photo Magazin. Hasselblad and Zeiss publish the MTF curves for their lenses in their sites. Compatibility is an extraordinary asset, carefully maintained by the brand. Rusticity was one, which grows blurred. Hasselblad moves much lately, undoubtedly under the impulse of the new owners. Some improvements are useful : a curtain on the 200 series, a zoom 60/120 F. But it results a somewhat blurred activism from it: was it necessary to come out the 201 F to replace it with two years by the 202FA ? Was the 503CXi essential in waiting of the 503 CW ? Were the CB lenses essential to the system just before the output of the CFi ? All that could be more logical if a true automatic side of the system was introduced. With the old ones : the release give the T mode by the locking of the pawl. The lack of the T mode is annoying, mainly for astro work. Lack of the checking window is a pain in the neck, as to be winded or not is critical with a Hasselblad (to be or not to be winded, that is the question!) : it has been introduced with the 2003 FCW. A misfit on that body may conclude in a death penalty for the shutter, with $$$ bill. Thanks to progress, the nightmare will become true! how old is my Hassy? Cameras, backs, accessories : Hasselblad uses a code. R. Monaghan, THE site for MF. Unjamming an Hasselblad is now in a dedicated page.